Today Computer and Smarphones are used every where in the world. Now a day the repairing of computer and smartphone is not too difficult. Lots of tool are available online that can help how to repair computer and smartphone without going to any shop or computer hardware expert. In this article I am sharing a very perfect learning tool for people who want to repair smartphone /computer at home. The name of this tool is “Computer Repair Simulator” .This tool is a game but actually it is not just a game, it is a learning tool. 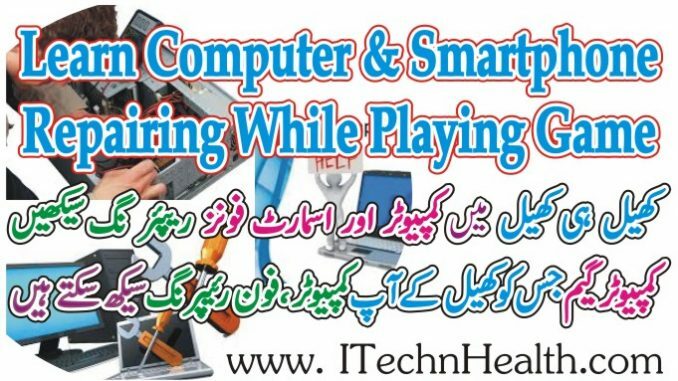 While playing this game you will learn how to repair computer and smarthphone. This game teaches you how a computer works and how to repair it. In this game you can learn about copper and fiber cable, server farms, networks (LAN, WAN, Wireless), LCD televisions, cell phones, computers / laptops, servers, server cabinets, cabinet cooling systems, remote monitoring systems, security, operating systems, and computer peripherals. The game is a realistic simulation of computer repairs, with a realistic computer model with all the parts, software that a real computer has. The game places you into a number of different scenarios, which can be user generated, pre-made or randomly generated. Repairing hardware failures on desktop or laptop computers, setting up operating systems and fixing software issues and even repairing smart phones. This game can be used as an effective learning tool in schools and also that it can be a fun experience. The demos or trailer of this game is available in link given below. To see these demos you can learn how this game work. How to Download and Install Computer Repair Simulator. If you face any problem while downloading or installing of this game then please see the video link given below and learn how to fix problem regarding installation and playing this game.